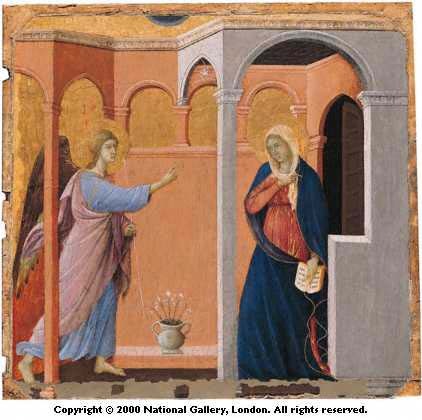 Duccio, The Annunciation. National Gallery, London. birth to the Son of God. She holds in her hand a Bible that prophesies* the birth; on her right is a vase of lilies, symbolizing her purity. There are signs of the kinds of experimentation that prefigured renaissance art: the backgound of pillars is drawn with a sense of perspective, and the clothes of Raphael are drawn with a sense of motion. Nonetheless, the poses are stylized, and the allegorical meaning of the painting is stronger than its realism -- the lilies, the background of gold*, and the Bible conveniently held open. This scene comes from the 'Maestà', a huge altarpiece painted on both sides by the Sienese painter Duccio and his workshop for the high altar of the cathedral in Siena. It was dismembered in 1771. "Behold a Virgin shall conceive and bear a son and he shall be called [Emmanuel]." From the Old Testament (Isaiah 7: 14). The symbolic meaning of gold in the natural order of nature is explored elsewhere on this site CD-ROM.